Big Brother 17 Starts Tonight! Its back again for another season. Big Brother 17 is alive and kicking! Tune in on CBS or better yet, get CBS All Access and you can watch the Live Feeds yourself starting after Thursday night’s show! 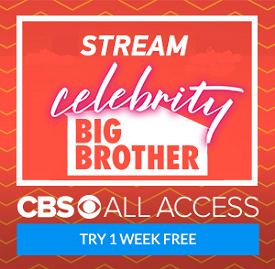 Click on the button to sign up for a free one week trial of the live feeds that also includes EVERY episode from every past season of Big Brother and many other CBS Shows. In certain areas you can also watch CBS LIVE on your computer, roku or mobile devices. I’ll be back later on with updates once we know a bit more about whats going on in the house. The HGs actually moved in late last week. Catching you up on the Big Brother Live Feeds. This week has been actually pretty quiet on the live feeds. As soon as Donny won the POV on Saturday we knew that Devin was going home. We will see him leave tonight by an 11-0 vote. There is a slim chance it might be 10-1 or 9-2 if Christine and Nicole vote for Caleb as a way to cause turmoil in the house. Another update after the show with details on what to expect next week. The live feeds will continue 24×7 for the next three months. You can check them out for yourself by clicking here or via any banner link on the site!